Wide ranges of organochlorine residues were determined in the blubber of franciscana (Pontoporia blainvillei), estuarine dolphin (Sotalia guianensis), Atlantic spotted dolphin (Stenella frontalis), and long-beaked common dolphin (Delphinus capensis) incidentally caught along Brazilian coastal waters. Concentrations of DDTs and PCBs were the highest, followed by CHLs, TCPMOH, dieldrin, TCPMe, heptachlor epoxide, HCB, and HCHs. Unexpectedly, significant pollution of PCBs, DDTs, TCPMe, and TCPMOH were observed in cetaceans from Brazil, implying the occurrence of local sources in the Southern Hemisphere comparable to those in the Northern Hemisphere, probably by high industrialization in Brazil. On the other hand, CHLs, HCB, HCHs, heptachlor epoxide, and dieldrin residue levels in Brazilian dolphins were much lower than those in other species from the Northern Hemisphere. 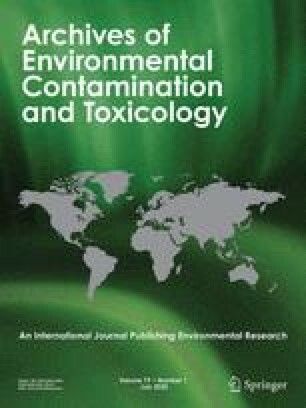 Significant correlations of TCPMe and TCPMOH were found along with PCBs and DDTs, indicating the highly bioaccumulative nature of all these compounds and/or possible similar pollution sources.